Now, here are some naughty treat ideas…. (1) Don’t make the balls too big. Once you dip them in the candy coating, it makes them heavy. The weight makes the whole ball slide down the stick so that the stick pops right through the top. Go for a small, super-ball size. (2) Melt a lot of candy coating…don’t skimp or you’ll be melting it again halfway through the dipping process. 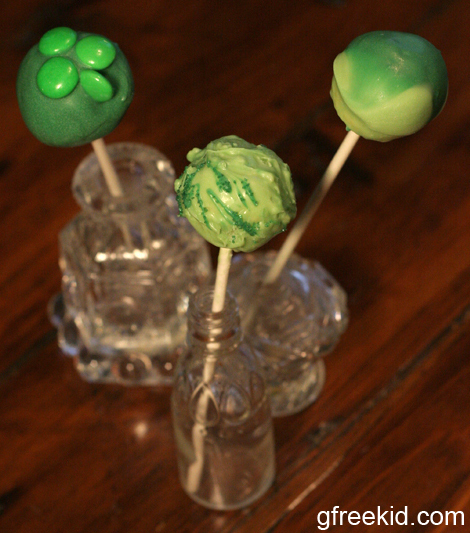 For those extra-motivated Moms: I saw other “leprechaun pops” recently: much fancier than mine, from the ultra-creative Jill over at Kitchen Fun With My 3 Sons. So, knock yourselves out! 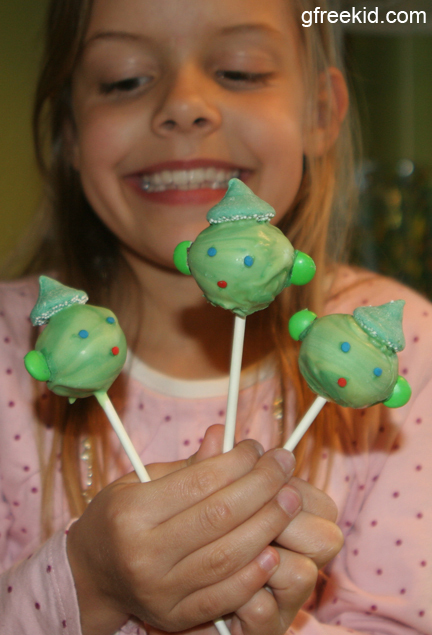 These cake balls also easier for kids to help with than cake pops. After these had hardened, I called my girls back down to hold them so you could see their size here. Directions: For both the cake pops and cake balls, all I did was to mush together what was left of a frosted vanilla cake (about 2/3 of it) from a party the day before. The cake was made with Betty Crocker Gluten Free Yellow Cake mix and Pillsbury vanilla frosting. I didn’t add anything else. Let your kids mush up the cake, roll into tight little balls, then cover with candy coating. I used Make n’ Mold candy wafers for the coating. They were really delicious. To me, they tasted just like “donut holes” that we used to eat before going GF. 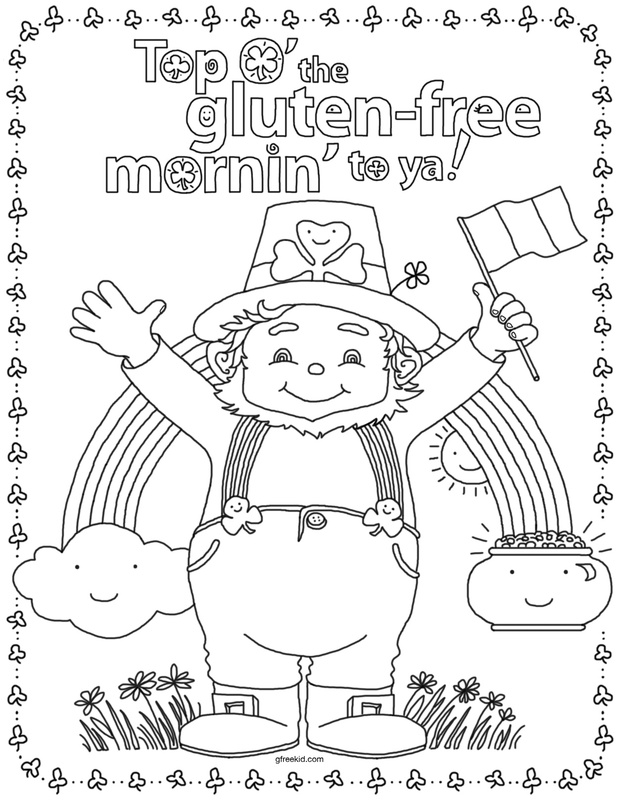 Last, but not least, I want to share (again) this gluten-free coloring page I created for your g-free kid to enjoy. (Print from the link — not from the preview below.) 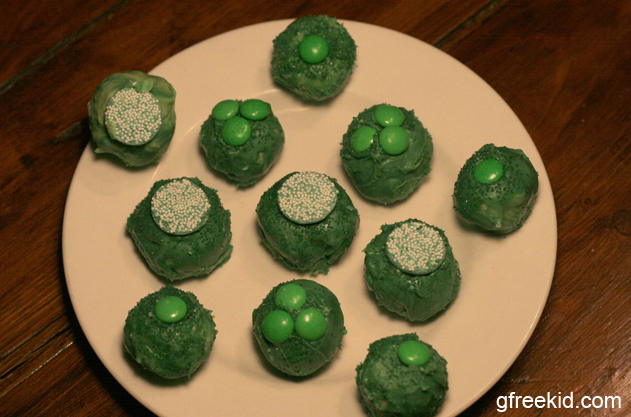 Have you tried anything from my St. Patty’s Day posts? If so, please feel free to upload a picture of your child with his or her finished product on my Facebook wall. I would love to see it! New to this site? 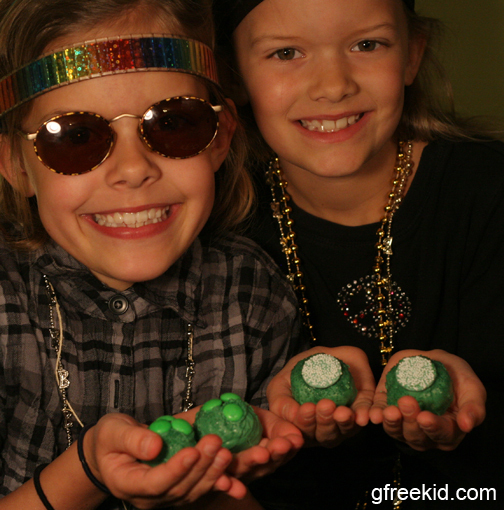 Be sure to see the photo album of g-free kids and g-free kids’ stuff page. And for much more in between posts, follow me on Facebook and Twitter. This entry was posted in Activities for g-free kids, coloring pages, fun for kids, g-free recipes, holiday, kids in the kitchen, recipes and tagged cake pops, celiac kid, coloring page, desserts, fun ideas, gluten sensitive, gluten-free kid, holiday, ideas, kids helping, kitchen, parties, pretzels, st. patrick's day, treats by kachalmers2. Bookmark the permalink.